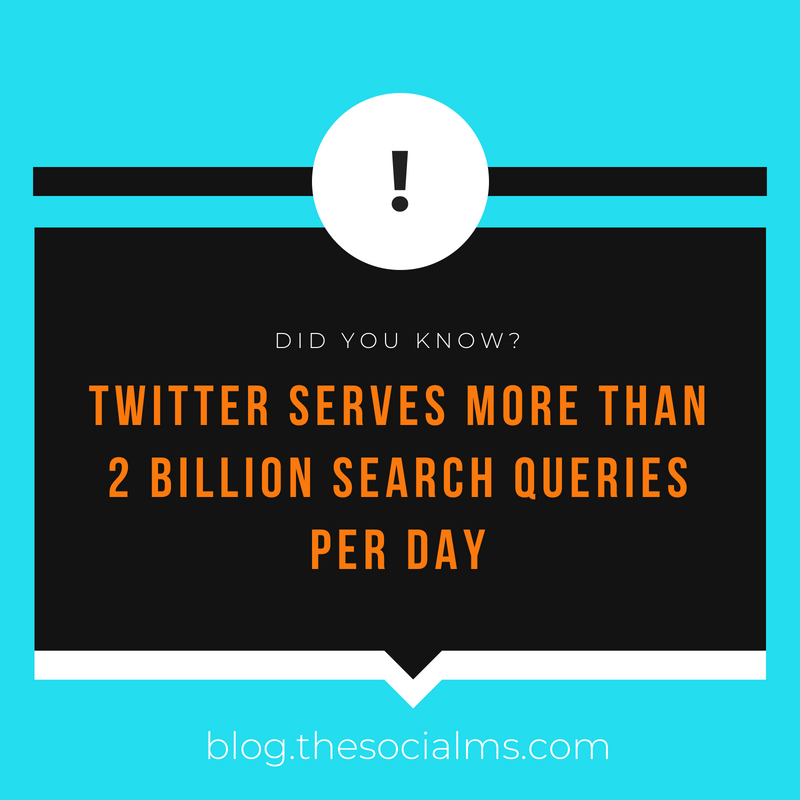 Did you know that more than 2 billions of search queries are conducted on Twitter every day? Maybe the number of searches would be a little smaller – or even bigger – if everybody knew about the Twitter advanced search and all the possibilities that come with it. Almost anything on Twitter is searchable. There is far more to Twitter search than the little search bar in the top right corner of your Twitter web interface. Twitter has a very powerful search engine. And, no: you do not even need to have a Twitter account or be logged in to use all the search options on Twitter. 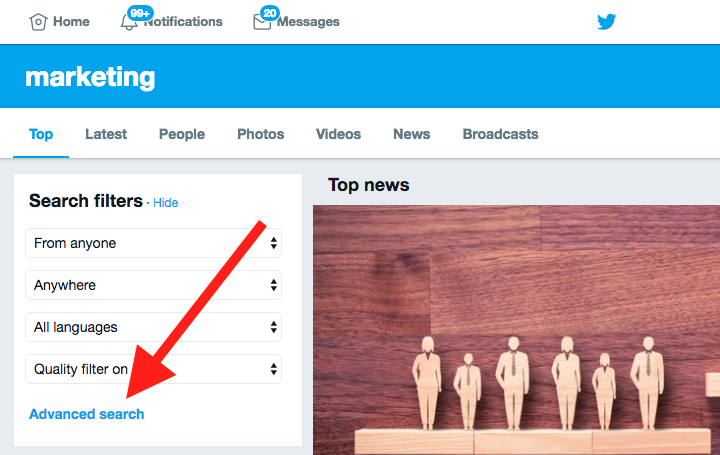 You have probably used Twitter’s search toolbar in the past: Simply type a keyword, phrase, hashtag – or even a Twitter username into the search box at the top right of your Twitter website. And you will get a bunch of results. Alternatively, you may have used the mobile search or the search page for non-member users. I admit that I rarely find what I am searching for in the “Top” section of the search results. Rather what I am looking for is either hidden in the “Latest” or the “News” section or I search for people or accounts which you can find in the “People” listing. 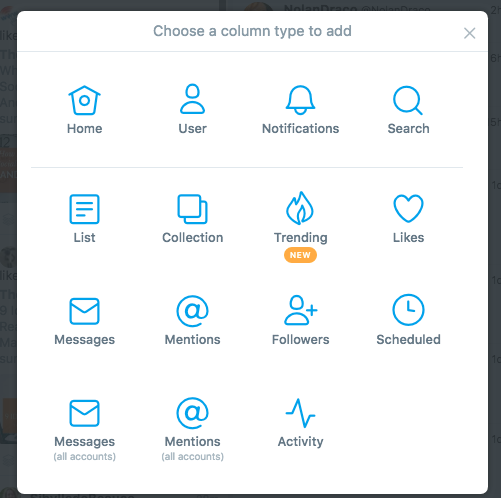 In many cases, when you are just performing a quick and simple search the results you get from this simple form of search on Twitter via the search toolbar are sufficient. But sometimes when you are looking for something more specific you will need some additional options. Like limiting the search results to an area around a specific location. Or combine some keywords or hashtags. Or search for a keyword just in tweets with links to a specific URL. Or search for a keyword but exclude another keyword from the results. Or search in Tweets from a specific timeframe. There are endless options for searches that make total sense in a certain situation. And Twitter absolutely has the tools to allow you to search for a very unusual but specific search. 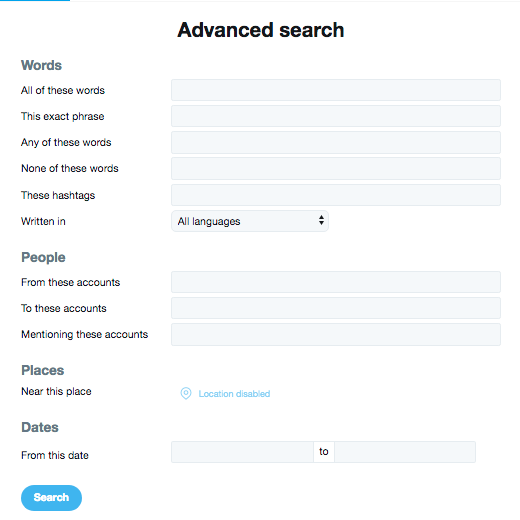 Twitter users can search for almost anything on Twitter with the Twitter advanced search. 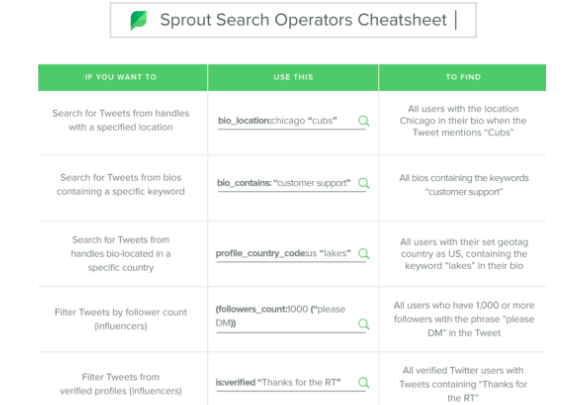 While the search operators come very handy, you do not need to memorize all of them right now. You can either use a list of these operators. For instance, the above list on Sprout Social that you can download on their website. Or you head over to the Twitter advanced search on Twitter’s web app. 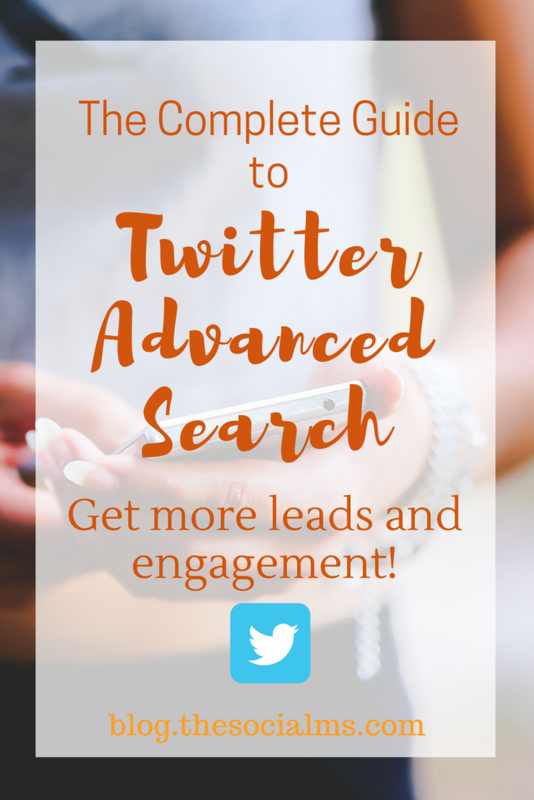 The Twitter advanced search form allows you to specify what you can otherwise specify with the search operators by simply filling out the relevant search fields. You can combine any of the search filters in the form. Only the location will only be activated if you activated location for all your tweets. Twitter’s advanced search turns Twitter into a very powerful search engine. All of these words: You can enter multiple words. The search will show tweets, accounts that contain every one of the specified words no matter in what order or if they where in the tweet or bio. This is the default search option. None of these words: This will only search results that do NOT include any of these words. On its own, this does not make sense. In combination with one of the other operators, this can be awesome to avoid search results diluted with irrelevant stuff. The search operator is -word – for example, “holiday” -beach will give you tweets containing the word holiday but NOT the word beach. Dates: You can specify a date range for the search results. The location search offers far more options than the Twitter Advanced Search form lets on. If you know the search operators for the location this a very helpful option for any local business. Instead of the name of the location Berlin you could also use full address, postal code – or the geo-location. The geolocation is probably the most accurate way to specify the location. You can find the geolocation of any place via Google maps. Sure, the Twitter advanced search form will get you far when you are looking for something directly on Twitter. But there are other places where you cannot use the search form but you can still use the search operators. For instance, you can follow a Twitter feed for a search you conducted. Are you using Tweetdeck? You should check it out. It is a Twitter client and free to use. Tweetdeck allows you to set up various feeds for Twitter. You can follow your own feed plus the feed of other accounts you may be running. You can also set up a feed for each of your Twitter lists. Plus, you can set up a feed to follow a specific search term on Twitter. This way every new tweet that matches your search criteria will show up in the feed that you created on Tweetdeck. For instance, if you are looking for leads on Twitter or want to engage with targeted people, you can monitor conversations around a search phrase from your niche. Whenever a new comment comes in or a conversation is started, you will see it in your search feed on Tweetdeck and can answer. 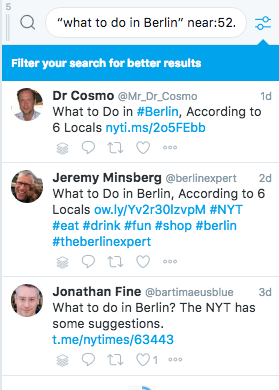 So, if I am a Berlin tour guide and looking for people who want to have a special tour in Berlin, I could monitor tweets for “what to do in Berlin” with a central Berlin Geocode and a reasonable radius. For any tweet that sounds as if someone would be interested, I could answer and suggest a special tour. This example is just to show you how flexible the Twitter advanced search can be used to find exactly the conversations on Twitter that you are looking for! Some companies have used searches like this to set up a Twitter lead generation strategy to engage potential customers by providing them the answer they searched for. Check out the example of Hilton Suggests here. This example shows that even marketers can make good use of Twitter advanced search.